Jean Omer Marie Gabriel Monnet (November 9, 1888 – March 16, 1979) is regarded by many as a chief architect of European Unity. Never elected to public office, Monnet worked behind the scenes of American and European governments as a well-connected pragmatic internationalist. He was Deputy Secretary-General of the League of Nations from 1919 until 1923. Between 1934 to 1936 he worked in China, advising on the organization of the railway system. During World War II he played a major role working for the Allies coordinating arms production and distribution. After the war, he assisted in the reconstruction of France serving as Planning Commissioner for the nation, and was involved in plans to establish the European Coal and Steel Community. He was first President of its High Authority from 1952 until 1955 when he retired. Always keen to push unity further, he became president of the Action Committee for the United States of Europe in 1956. Monnet had a hatred of war and a passion for peace. He saw the nation-state as an obstacle to peace, since nations act in their own interest and covet the territory or resources of other states. He was convinced that a world in which the state receded in significance would be more prosperous, more committed to peace. He believed that just distribution of resources and equity between people would consign war to the nursery of human life. Monnet was able to apply business experience gained while working for his family's company and in banking to the urgent issues of the day, namely an efficient war machinery followed by forming a mechanism to ensure that the peace once won would be sustained. Perhaps he exerted the degree of influence he did because he was not a professional politician or even for much of his life a professional public servant. Rather, he was a member of civil society who wanted to use his skills for the greater good. Success in business for him was never about accumulating excessive wealth. It was about acquiring skills he could then apply to work for peace and a fairer social order. Jean Monnet was born in Cognac, France, into a family of cognac merchants. At the age of 16, he abandoned his university-entrance examinations part way through and moved to London where he spent 1904-1906 in the City of London with the agent of his father's company there, learning the trade. Subsequently, he traveled widely — to Scandinavia, Russia, Egypt, Canada, and the United States — for the family business representing the company in the international markets. In August 1929, during a dinner party in Paris, the 41-year-old Monnet met the 22-year-old Italian painter Silvia Giannini (born in Bondini in 1907). She had recently (April 6, 1929) married Francisco Giannini, an employee of Monnet when he was a representative in Italy. In April 1931, Silvia had a child, Anna. Legally the father was Francisco Giannini. Divorce was not allowed in France and many other European countries at that time. In 1934, Silvia and Jean Monnet met in Moscow; he was coming from China with the Trans-Siberian, she from Switzerland. He arranged for Silvia to obtain Soviet citizenship; she immediately divorced her husband and married Jean Monnet. The idea for the Moscow marriage came from Dr. Ludwik Rajchman whom Monnet met during his time at the League of Nations (Rajchman was connected to the Soviet Ambassador to China, Bogomolov). It seems that the American and French ambassadors in Moscow, William Bullitt and Charles Aiphand, also played a role. The custody of Anna was a problem. In 1935 Silvia with Anna took refuge in the Soviet consulate in Shanghai, where they were living at the time because Francisco Giannini tried to obtain custody of the child. The legal battle continued with a ruling in favor of Silvia in 1937 in New York, but this was not recognized in some other countries. In 1941, they had another child, Marianne. The Monnet family only came back to France 1945. After the death of Francisco Giannini in 1974, they married canonically in the cathedral of Lourdes; both were devoutly Catholic. After retiring to his home in Houjarray, Monnet wrote his memoirs. He died in 1979 at the age of 90. In 1988, by order of the president François Mitterrand, Jean Monnet's remains were transferred to the Panthéon of Paris. In 1914, Monnet was excused from military duty in World War I for health reasons. He set to making himself useful in other ways, namely by tackling the looming problem of organizing supplies, which the Allies were unable to resolve and which could have compromised the outcome of the conflict. Monnet believed that the only path that would lead to an Allied victory lay in the merging of France and Britain's war efforts and he proposed a plan that would co-ordinate war resources. The French government agreed upon its implementation: in 1914, he met French Premier René Viviani on this issue. Due to his success in the war efforts, Monnet, at the age of 31, was named Deputy Secretary General of the League of Nations upon its creation in 1919 by French premier Georges Clemenceau and British statesman Arthur Balfour. Soon disillusioned with the League because of its laborious unanimous decision-making processes and especially with how the "veto" made it impossible for states to overcome their "national egos" Monnet resigned in 1923 in order to devote himself to managing the family business, J.G. Monnet & Co (a cognac retailer) which was experiencing difficulties. However, he soon handed over the running of the company to cousins, in order to join the French branch of Blair & Co. as Vice-President. Later, as an international financier, he proved to be instrumental in the economic recovery of several Central and Eastern European nations, helping to stabilize the Polish zloty in 1927 and the Romanian leu in 1928. In 1929, his experience in international finance led him to found and co-manage the Bancamerica-Blair, a bank in San Francisco. From 1934 to 1936, at the invitation of Chiang Kai-shek, Monnet lived in China, assisting with the reorganization of the Chinese railway network. In December, 1939, Jean Monnet was sent to London to oversee the collectivization of the two countries' war production capacities. Monnet's influence inspired Charles de Gaulle and Winston Churchill to accept a plan for a union of France and the United Kingdom to rival the Nazi union of Germany and France. In August 1940, Jean Monnet was sent to the United States by the British government as a member of the British Supply Council, in order to negotiate the purchase of war supplies. Soon after his arrival in Washington, D.C., he became an adviser to Pres. Franklin Delano Roosevelt. Convinced that America could serve as "the great arsenal of democracy" he persuaded the president to launch a massive arms production program to supply the Allies with military material. Shortly thereafter, in 1941, Roosevelt, with Churchill's agreement, launched the Victory Program, which represented the entry of the United States into the war effort. After the war, the British economist John Maynard Keynes was to say that through his coordinating effort, Monnet had probably shortened World War II by one year. "There will be no peace in Europe, if the states are reconstituted on the basis of national sovereignty…. The countries of Europe are too small to guarantee their peoples the necessary prosperity and social development. The European states must constitute themselves into a federation…." Following World War II, France was in severe need of reconstruction. To rebuild, France was completely dependent on coal from Germany's main remaining coal-mining areas, the Ruhr area and the Saar area (The German coal fields in Upper Silesia had been handed over for "Polish administration" by the Allies in 1945. In 1945 Monnet proposed the Monnet plan, also known as the theory of l’engrenage, not to be confused with the Schumann plan, to take control of the remaining coal producing German areas and redirect the production away from German industry and into French industry instead, permanently weakening Germany and raising the French economy considerably above its pre-war levels. The plan was adopted by Charles de Gaulle in early 1946. In 1947 France, with U.S. support, removed the Saar from Germany and turned it into the Saar protectorate, nominally politically independent and under complete French economic control. The area returned to German political administration in 1957 (economic reunification would take many years longer), but France retained the right to mine from its coal mines until 1981. The Ruhr Agreement was imposed on the Germans as a condition for permitting them to establish the Federal Republic of Germany. The IAR controlled production levels, pricing, and markets where the output was to be sold, thus ensuring that France would receive a large portion of the Ruhr coal production at low prices. With the 1951 German agreement to join the European Coal and Steel Community (ECSC)(the "Schuman plan") the ongoing Allied dismantling of German industry was finally stopped. With the entry into force of the ECSC in 1952 the last civilian production limitations placed on German industry were lifted, and the role of the IAR was taken over by the ECSC. As the head of France's General Planning Commission, Monnet was the real author of what has become known as the 1950 "Schuman Plan" to create the European Coal and Steel Community (ECSC), forerunner of the Common Market. "Since Franco-German rivalry is a threat to peace," he said, "let's transform it into a peaceful union. "Let us convert," he continued, "our arsenals of coal and steel into common industrial wealth." Monnet also said, "Via money Europe could become political in five years" and "… the current communities should be completed by a Finance Common Market which would lead us to European economic unity. Only then would … the mutual commitments make it fairly easy to produce the political union which is the goal." Following liberation, Monnet proposed a "global plan for modernization and economic development" to the French government. "Through the consolidation of basic production and the institution of a new High Authority, whose decisions will bind France, Germany and the other countries that join, this proposal represents the first concrete step towards a European federation, imperative for the preservation of peace." Monnet, say Brinkley and Hackett, found himself harnessing for the cause of peace the skills he had used to aid the effort to win the war. Shortly thereafter, West Germany, Italy, Belgium, Luxembourg, and the Netherlands responded favorably, the European Coal and Steel Community (ECSC) was born. Britain was invited to participate, but it refused on grounds of national sovereignty. In 1952, Jean Monnet became the first president of the High Authority. In 1953 Monnet was awarded the Karlspreis by the city of Aachen in recognition of his achievements. 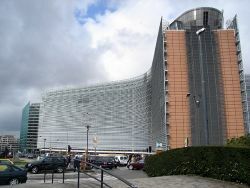 Seat of the European Commission. In 1955, Monnet founded the Action Committee for the United States of Europe in order to revive European construction following the failure of the European Defense Community (EDC). It brought political parties and European trade unions together to become a driving force behind the initiatives which laid the foundation for the European Union as it eventually emerged: first the European Economic Community (EEC) (1958) (known commonly as the "Common Market"), which was established by the Treaty of Rome of 1957; later the European Community (1967) with its corresponding bodies, the European Commission and the European Council of Ministers, British membership in the Community (1973), the European Council (1974), the European Monetary System (1979), and the European Parliament (1979). This process reflected Monnet's belief in a gradualist approach for constructing European unity. "Building Union among people not cooperation between states"
Sometimes credited with coining the phrase "Arsenal of Democracy" which was used by, and credited to, Franklin D. Roosevelt. However, American playwright Robert Emmet Sherwood is credited with originating the phrase which came to be shortened as the 'arsenal of democracy' and later used by Franklin Roosevelt in his speeches. Sherwood had been quoted on May 12, 1940 by the New York Times, "this country is already, in effect, an arsenal for the democratic Allies." Although Monnet had allegedly used the phrase later in 1940, "arsenal of democracy," he was urged not to use it again so Franklin Roosevelt could make use of it in his speeches. The Jean Monnet Building of the European Commission, rue Albert Wehrer, L-2920 Luxembourg is named after him. The European Union itself maintains his memory with the Jean Monnet Programme of the Directorate-General for Education and Culture. This aims to promote knowledge on European integration on a worldwide scale, especially at the university level. In a considerable number of European universities Jean Monnet's memory lives on, including the University of Limerick, Ireland, where a lecture theater is named in honor of Jean Monnet, and regular summer school sessions are held on the topic of European Integration. 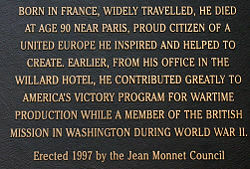 British universities which honor Monnet include the East Midlands Eurocenter at Loughborough University, the European Research Institute at the University of Bath, the at the University of Birmingham, the Jean Monnet European Center of Excellence at Cambridge, the Jean Monnet European Center of Excellence at the University of Essex, the Centre for European Union Studies] at the University of Hull, the Kent Centre for Europe] at the University of Kent, the Jean Monnet Centre of Excellence], a partnership between the University of Manchester, Manchester Metropolitan University and the University of Salford, the at Newcastle University and the Jean Monnet Centre for European Studies at the University of Wales, Aberystwyth. Among those who have acknowledged his influence are Edward Heath and Willy Brandt. Monnet and his co-founders always saw the Community of Coal and Steel as a mechanism to end war by creating stronger economic ties between the nations of Europe. Monnet's fundamental aim was to "unite people for peace." His "hatred of war and his impatience for peace was immoderate," say Brinkley and Hackett. With Alcide De Gasperi he was convinced that by ensuring a more equitable distribution of and access to resources, an inter-linked and inter-dependent Europe would put old rivalries behind it. With others, he foresaw a limited role for the nation-state as a larger federal entity evolves. The self-interest of nation states often prevents them acting in ways that are fair to other states, so much so that atrocities and crimes against humanity go unchecked because corporately the nations can not agree to act in defense of the defenseless. For example, despite treaty obligation to prevent genocide, the member countries of the United Nations failed to intervene in Rwanda. "To the end of his life," observe Brinkley and Hackett, "Monnet went on pursuing the goal of international peace." I have known no great politician who was not strongly “egocentric, and for good reason” if he were not so, he would never have imposed his image and his persona. I could not have been this way, not that I was modest, but one cannot concentrate on one thing and one oneself. And this thing has always been the same for me –to make all men work together, to show them that beyond their divergences or over and above frontiers, they have a common interest. If competition was lively around power, it was practically zero in the domain in which I wanted to act, that of preparing for the future, which by definition is not illuminated by the lights of current affairs. He set himself the goal of serving the public but chose to do much of what he did as a private citizen. His life set a good example for anyone interested in furthering the cause of peace to follow. ↑ 1.0 1.1 Who is Jean Monnet? Jean Monnet Scholarship Programme. Retrieved December 19, 2018. ↑ Heikki Patomäki, The political economy of Global Security: War, future crises and changes in global governance (London, UK: Routledge, 2008. ISBN 978-0415416726), 262. Note 9. ↑ Amos Yoder, "The Ruhr Authority and the German Problem" The Review of Politics 17(3) (1955):345-348. ↑ Douglas Brinkley and Clifford P. Hackett, Jean Monnet: The path to European unity (New York, NY: St. Martin's Press, 1991), 49. ↑ Christopher Booker, and Richard North, The Great Deception: The Secret History of the European Union. (London, UK: Continuum, 2005, ISBN 978-0826476524), 88. ↑ Brinkley and Hackett, 1991, 176. ↑ The Schuman Declaration – 9 May 1950 European Union. Retrieved December 19, 2018. ↑ Brinkley and Hackett, 1991, 130. ↑ Jack Gould, The Broadway Stage Has Its First War Play The New York Times., 1940. Quoting Robert Emmet Sherwood, this country is already, in effect, an arsenal for the democratic Allies. ↑ Charles K. Robinson, European Union TIME Magazine, October 13, 1961. Retrieved December 19, 2018. ↑ Brinkley and Hackett, 1991, 117. ↑ Brinkley and Hackett, 1991, 24. ↑ Brinkley and Hackett, 1991, 52. ↑ Brinkley and Hackett, 1991, 126. Brinkley, Douglas, and Clifford P. Hackett.Jean Monnet: the path to European unity. New York, NY: St. Martin's Press, 1991. ISBN 978-0312047733. Booker, Christopher, and Richard North. The Great Deception: The Secret History of the European Union. London, UK: Continuum, 2005. ISBN 978-0826476524. Duchêne, François, and Jean Monnet. Jean Monnet: the first statesman of interdependence. New York, NY: Norton, 1994. ISBN 978-0393034974. Kotlowski, Dean J. The European Union: from Jean Monnet to the Euro. Athens, OH: Ohio University Press, 2000. ISBN 978-0821413319. Monnet, Jean. Memoirs. Garden City, NY: Doubleday, 1978. ISBN 978-0385125055. Nelsen, Brent F., and Alexander C-G. Stubb. The European Union: readings on the theory and practice of European integration. Boulder, CO: L. Rienner, 1994. ISBN 978-1555875053. Patomäki, Heikki. The political economy of global security: war, future crises and changes in global governance. (Rethinking globalizations, 11.) London, UK: Routledge, 2008. ISBN 978-0415416726. Jean Monnet - Centre Virtuel de la Connaissance sur l'Europe. This page was last modified on 19 December 2018, at 22:36.